An unexpected twist in the Ohio chemo case, summarized in this headline: “Guardian wants Ohio court ruling to stand in Amish chemo case even though she wants off case” (article no longer online). We got news about a month ago that the court-appointed guardian wished to drop the effort to enforce chemotherapy treatments on Sarah Hershberger, an Ohio Amish girl with leukemia. Clair Dickinson, the guardian’s attorney, argued that even if the resignation is accepted, the court legally would remain the girl’s “superior guardian” and could appoint a replacement. However, Dickinson said earlier that an attorney told him the hospital won’t continue its legal push to get chemotherapy for Sarah if Schimer’s resignation is approved. All of you struggling to survive in winter storm lands, I thought you might appreciate this. Last month an 8-year-old Amish boy was apparently accidentally shot by his older brother in Cattaraugus County, New York. The 20-year-old brother was charged with fourth-degree criminal possession of a weapon. Many Amish children grow up in homes with guns. I assume most get lessons from their parents on what to do and what not to do with firearms. Still, people do irresponsible things, sometimes with tragic results. Thankfully the brother has survived his injuries. Amish depend on each other, but they also depend on English people, to which this touching eulogy and amusing poem attest. Feathered friends in Indiana enjoying some bird chow. A great mixture of varied topics. I especially enjoyed the clip about Pinecraft. I’ve seen many “still life” pictures of life at Pinecraft, but never one that showed people in action like this clip. I also enjoyed the poems. They reminded me of poems I read in The Budget. Each week has several poems on the obituaries and in memoriam page, and others about various themes on the “Ponderings and Musings” page. I have a question, about that video. In the last clip, there was a buggy being driven away into the distance, with a young Amish girl inside it, and maybe others too. How was it powered as there didn’t seem to be any horses? Loved the painting though, it was great and the video was interesting too. Thanks. At the bottom of the video it said it was a solar powered buggy. My interest is peaked though! Any chance we can find out more about the solar powered buggy Erik? I can’t watch the video, so I cannot positively ID the solar powered buggy, but I’m guessing its Larry Yoder’s creation. Larry has local shops build his creations and he takes them down to pinecraft during his winter trip south. Larry is not Amish but a liberal mennonite who owns a company called Yoder Drainage. Over time Larry has had many unique mobile creations. They are toys, not the next wave of Amish innovation. Thanks for the updates and love that bird feeder! Love the painting. The poems were nice too. Really loved the bird feeder. Where can they be found. Are they for sale and how much do they cost? Could you send me an e mail on this please. Thank you. The bird feeder is made by John Hochstetler, an Amishman here in Shipshewana, Indiana. The number below is a voicemail, but if you leave a message he will call you back. The metal feeder pole with hooks is also something he sells. I think it was about 65 dollars, it’s a great deal. He also makes some fantastic blue bird feeders, including one that suction cups to the window. I’m not sure how much shipping would be. 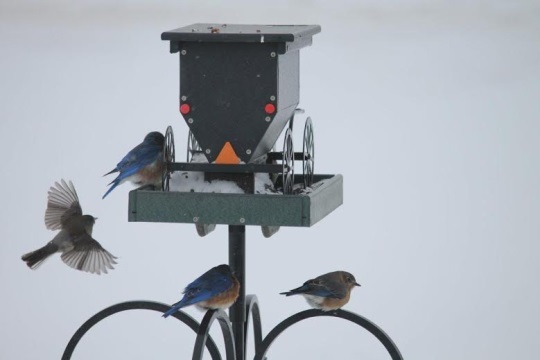 AmishWorkshops.com also sells his feeders over the Internet. Once he got over being stunned, he laughed and told her, but since then we’ve all realized that to the community Ruth grew up in, age is revered. If you are “gray headed” you are considered worthy of respect. So she was giving proper acknowledgement: another example of how the two cultures are at odds with one another. Little doubt in my mind as to which is the more Biblical. What a sweet, disarming story about Ruth. My husband and I started attending an Amish Mennonite church last year. We were surprised that when the 2014 church calendar was published, it included everyone’s birth year along with month and day. It’s neat to know how old the oldest members are, and also to realize (!) how much older we are than some of the younger couples. It also helps us to know our children’s age peers. I’ve always thought the stigma against knowing someone’s age to be a bit silly. I wish we could meet Ed. I believe you have mentioned that he went to VA Tech and played cello. My husband and I met as music majors at JMU, also in the Shen. Valley. I hope he and Ruth are managing to stay warm. I’m not 70, but younger Amish acquaintances and friends of family aren’t shy of telling me I’m getting old and pointing out grey at the temples. I guess they’re just showing respect?? 🙂 Loved this story Anne. Oh the pain . . .
. . . of not being in Pinecraft in January for the first time in fifteen years. But when I tell my friends, they are unmoved by my longings for warmth, citrus, and lots of great chatting at Der Dutchman with breakfast and coffee and long-time friends. But this too will pass, and spring will come to southcentral Pennsylvania–eventually. Rich P.S. I was actually there when the first Pinecraft mural was painted–warm memories on an otherwise bitter day. Thanks for the diversion from a gloomy (though warmer—over 32 degrees—Winter’s Day in Northern Illinois. I think I saw myself in the Pinecraft video 😉 , or at least a future vision of myself. I’ve always “threatened” my adult children that it won’t be long before I get a 3-wheeler and start cruisin’ around town. Of course, I wouldn’t mind using a solar buggy, either, but I doubt the “rules of the road” here would allow it. Once again, with the accidental shooting, English vs. Amish laws come into play. I’m glad the brother survived, and hope the older brother fares well despite the charges. Thanks to Alice Mary for your enjoyment of Ruth’s comments. So innocent, yet so inappropriate for a culture that idolizes youth. Soon I hope to write more to Erik, about more funny things that happened on our trip last October with them. Had a great time, some good laughs. If you’ll look in the lower right hand corner of Watching Anna Lapp Paint, at :42 and :56, you can see the picture she looked off of as the basis of her mural. The mural is way better than I could ever even think of painting. Polly want a plain cracker? I’ve been wondering when Erik would what he at one time called a “Brain drain” and this is it I suppose, I’d look into Amish America when there wasn’t activity – when I’m home on weekends (recently I’ve been working weekends, and disconnecting online at home afterwards) and wondering “when will he drop another brain drain?”, I like the idea of them. When I saw the bit about the artist in Pinecraft my thought process, the play on words section instantly went to “watching paint dry” or “watching grass grow”, but clearly this video ain’t that, I’ve seen weird trippy murals, in my municipality there is an artist who makes these bizzare marianette people looking three demensional instalations in civic buildings, libraries and hospitals, they’re not to my taste, but there is talent in that person’s work, just as there is talent in what I can see in Lapp’s work just based on the thumbnail-link thing. I have no comment on the chemo story, well I do, but it is intensely personal, emotional and frustraiting in addition to not having any relation to lukemia, so I’ll keep that card close to my chest. I was once told “do not aim your weapon at anything you do not intend to kill” and that has stuck with me, not everyone has this philosophy, and clearly the elder brother intended no harm, but accidents DO happen, not to call the 20 year old man one but comedians in Canada once gravely joked riffing on gun control and registries in this country “guns don’t kill people – idiots kill people”. I think the memorial and thank you poems are really sweet. When I was a boy my family had budgies as pets (why I used the Comment Title that I did), poop machines they where, this night (Sunday/Monday January 12/13 2014) I dreamed about these things trying to get their cage door open, they succeeded (as they did in real life) and I bet they would figure out, as birds do, how to get the food out of the buggy bird feeder, super cute! I suppose the the farm on which this feeder isn’t “‘truber” judging by the presence of the safety triangle. Any how, thanks for the updates on all this stuff. Shom you are right, there are often a lot of little items that are not really worthy of a full post, but might be worthy of discussion. Maybe should start doing these more regularly. I recall a few times that a “brain drain” item started out just as an item, then got too long and became its own post. Just an update on the chemo case, from a story that came out on Friday: it’s been ruled that the guardian can drop her attempt to enforce chemo treatments on Sarah Hershberger. The Hershberger family apparently returned home to Ohio from an out-of-state location a few weeks ago.